Yesterday I helped out the P2P folks at the West Central Community Center during the West Central Neighbor Day Festival. It was awesome. A great crew to work with and a great thing to do. 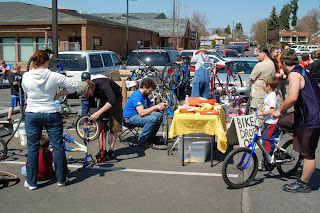 Lots of kids brought their bikes in for a wide variety of repairs. 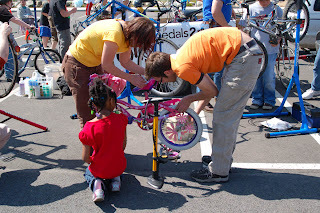 The gang got this young lady's bike all set because she was going to ride without training wheels for the first time. And she succeeded quite well. The look on her face was precious. I repaired a flat tire for one young man. Afterwards I looked the bike over and discovered he had no brakes. "Oh, I stop with my shoes," he says. So I turned him over to one of the real mechanics who fixed him up. His bike came off the stand and he rode around the parking lot to try it out. He kept Fred Flintsoning even though his Dad and I were reminding him he had brakes. I hope he breaks that habit soon. This is both fun and worthwhile if you ever want to volunteer. Even if all you can do is fix flats, which is pretty much my skill set, you'll be busy. I worked on a lot of tires. Not doing too bad. Last Saturday I did 17 miles. Today I was supposed to do 19 but I had to cut it to 16 since I had to be someplace by 10:00. It seems I can run forever if I stick to a ten-minute mile pace. As it is, I'm looking forward to the marathon on June 1--so I'll be done. When it rains, it pours. I stumbled across Mystery Meat Macrophotography showing close-up shots of various meat food products, salami, sausage and hot dogs, you would never find in my house. It's pretty disgusting stuff. Interesting occurrence this morning on my bike commute to work. I stopped at the 4-way at Lincoln and Standard. To my left, westbound on Lincoln, was a car with an iced up windshield and a 4x6-inch clear spot the driver was looking through. To my right, eastbound on Lincoln, was a Spokane police car. "Alright", I thought, "Someone is going to get pulled over." The blinded driver sat there and didn't budge while cars in all four directions pulled up and stopped. He flashed his lights, I believe for me to go ahead. He probably didn't see that I came to the stop after he did. I looked at the cop. He had a disgusted look on his face and he wasn't moving either. So nobody moved and I thought, "Alright, someone is going to get pulled over." Finally the blind driver went through the intersection. The cop was shaking his head and then he went through the intersection. I thought, "Hey wait--Shouldn't you?--Isn't he?--What if he?--Well, damn!" The Spokane Police Department recently announced they would be emphasizing the enforcement of jaywalking violations in the downtown area for the next couple of weeks. Presumably they've had a lot of pedestrians getting struck by cars with iced up windshields. Or something. Have a look at this article in Vanity Fair. More reason to support local farmers and have a garden of your own. My total mileage for each week is still short, but I'm getting longer runs in. Yesterday I did 13 miles in 2 hours. I'll have to start bringing something along to eat and drink now. I started flagging during the last mile because I got really hungry. That's to be expected, but going through the experience helps you remember it better. I saw plenty of cyclists yesterday. I wanted to join them so bad. About 16 months ago I switched to butter. I like butter. It's natural. I enjoy the creamy texture and the taste. Margarines and spreads are oil and chemicals. Although I use butter when I cook, when my kids have a choice they want the margarine dolloped on top of their mashed potatoes. Why? Because--get this--butter doesn't taste like butter. That, to me, is a good indicator of how much we've been conditioned by the food industry. The artificial butter taste is considered the authentic taste of butter. I've had concerns about our industrialized food system for quite some time now but wasn't sure what to do about it. So I started inserting better foods in my house. I talked my wife into getting a half of grass fed beef. The kids were sold on it. They thought the taste and texture were much better. We got half of a pig and even Kathy thought that was better. We started making our own bread and I taught the kids. Josh loves the heartiness of the homemade bread and he gladly makes a loaf when he's about to run out. Steph likes the fluffiness of the store bought stuff. You can't win 'em all, eh? Anyway, the reason I bring all this up is I've been concerned about the health and nutritional value of the food we eat but I didn't know enough about the subject. Enter "In Defense of Food" by Michael Pollan. He does a great job of explaining the changes made in our food over the years, how food products have replaced food, the effects our Western diet have had on us, and what we can do about it. Essentially, he described much of what I've been uneasy about and helped me understand it better. Now if I could just figure out how to keep the spinach from falling through the grill. We are witnessing America go down the tubes. Our economy is circling the drain so the Federal Reserve, which is the central banking system of our country, agreed to bail out Bear Stearns, which is not a bank but a securities firm. Now Bear Stearns wasn't the only company that benefited from the recent $200 billion handed out by the Fed. A number of CEOs of these crashing corporations like Merril Lynch, Countrywide, and Citi Group received millions in compensation--from the Fed! But the most important part to remember is that thanks to the Fed, we taxpayers are now responsible for a debt we did not incur. For those of you familiar with the economic interventions that took place in South American countries during the 1970's, you'll notice history repeating itself. The government bank takes on the debt of private banks and corporations and the people end up with an increased and unjust tax burden. Add this to the deferred cost of the never ending war on terrorism and our children's future looks pretty crappy. Will the economic stimulus package that gives us all a tax rebate this year help? Since they're borrowing the money for that, too, what do you think? Google has a great joke on this special pranking day. And Butterfinger came up with a great way to give everyone the finger. The best jokes are the ones that keep on giving. I once put a microphone and instructions for using the "voice recognition module" on a brand new Xerox machine at work. It was in place for a month. The prank came to an end when the Xerox rep held a training session. There was no mention of the voice recognition module so the question came up at the very end. The puzzled rep had this "what the hell are you talking about" look on his face. So I spoke up, "I put that microphone there." The look of shock on everyone's faces was priceless. I wish I could have recorded the stories they told about talking into the microphone. They have worked very hard to pay me back, but to no avail.